HCFCs are compounds containing carbon, hydrogen, chlorine and fluorine. Industry and the scientific community view certain chemicals within this class of compounds as acceptable temporary alternatives to chlorofluorocarbons. The HCFCs have shorter atmospheric lifetimes than CFCs and deliver less reactive chlorine to the stratosphere where the "ozone layer" is found. Consequently, it is expected that these chemicals will contribute much less to stratospheric ozone depletion than CFCs. Because they still contain chlorine and have the potential to destroy stratospheric ozone, they are viewed only as temporary replacements for the CFCs. Current international legislation has mandated production caps for HCFCs; production is prohibited after 2020 in developed countries and 2030 in developing countries. Figure 1. Observed Atmospheric Changes for Substitute Halocarbons from the NOAA/ESRL/GMD Flask Sampling Network. HCFCs are less stable than CFCs because HCFC molecules contain carbon-hydrogen bonds. Hydrogen, when attached to carbon in organic compounds such as these, is attacked by the hydroxyl radical in the lower part of the atmosphere known as the troposphere. (CFCs, because they contain no hydrogen, and, therefore, no carbon-hydrogen bonds, are not destroyed by the hydroxyl radical.) When HCFCs are oxidized in the troposphere, the chlorine released typically combines with other chemicals to form compounds that dissolve in water and ice and are removed from the atmosphere by precipitation. When HCFCs become destroyed in this way their chlorine does not reach the stratosphere and contribute to ozone destruction. A certain portion of HCFC molecules released to the atmosphere will reach the stratosphere and be destroyed there by photolysis (light-initiated decomposition). The chlorine released in the stratosphere can then participate in ozone depleting reactions as does chlorine liberated from the photolysis of CFCs. Because HCFCs are degraded significantly by two mechanisms in the atmosphere (as opposed to the CFCs which are destroyed almost exclusively by photolysis in the stratosphere), and because photolysis rates of HCFCs are generally slower than those for CFCs, proportionately less chlorine is released from HCFCs in the lower stratosphere when compared to CFCs. These properties explain why HCFCs are expected to deplete much less stratospheric ozone than equivalent amounts of CFCs. 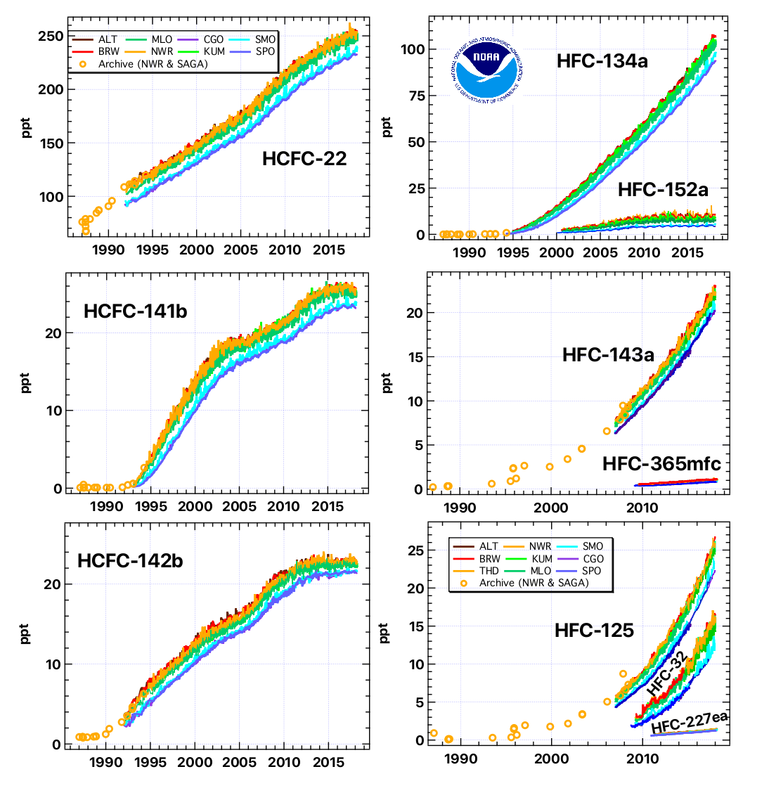 How have atmospheric concentrations of HCFCs changed over time? Regular, careful measurements of air from remote locations show that global concentrations of HCFCs have increased rapidly over time. This increase can be attributed to enhanced use of HCFCs as substitutes for CFCs and other chemicals as solvent/cleaning agents, refrigerants, foam-blowing agents, air conditioning fluids, etc., beginning in the late 1980s and early 1990s. Measurements of air stored in containers that were originally filled as early as 1977 and measurements of even older air trapped in snow above Antarctica or Greenland have allowed scientists at NOAA, CSIRO (Australia), and the University of East Anglia (UK) to reconstruct how concentrations of these gases have changed in the atmosphere over the past 100 years. The picture that emerges is one in which HCFCs were not present in the atmosphere in the early part of the 20th Century. Once their use was encouraged to aid in accelerating the phase out of CFCs and related ozone-depleting gases, HCFC concentrations increased rapidly from zero to the amounts observed today. With regard to stratospheric ozone depletion, have the increases in HCFC concentrations offset the decreases observed in atmospheric concentrations of the CFCs and other ozone-depleting chemicals? The balance of ozone in the stratosphere is determined by a number of important factors including the concentration of reactive chlorine and bromine chemicals. Dramatic increases in concentration of chlorine and bromine in the stratosphere since the 1950s have brought about enhanced ozone destruction. The destruction is most striking during the spring (Sep-Nov) over Antarctica, but is also observed to lesser extents over the Arctic during March-May and over mid-latitudes throughout the year. However, NOAA's measurements of CFCs, HCFCs and other ozone-depleting substances show that the total amount of chlorine and bromine in the atmosphere began decreasing in the 1990s! This decrease is a direct result of many nations adhering to regulations outlined in the Montreal Protocol to limit production of ozone-depleting substances. So while atmospheric concentrations of HCFCs continued to increase in the atmosphere, the declines observed to date for the more potent ozone-depleting substances (such as CFCs and methyl chloroform) have more than offset the enhanced influence of the HCFCs. Montreal Protocol regulations that restrict and eventually eliminate production of HCFCs are designed with the intent that HCFCs do not become more of a problem than the CFCs they replaced. What do NOAA/GMD measurements provide to public policy makers, the general public, and the scientific community? Is the Montreal Protocol working? Is the recovery in the ozone layer proceeding as expected? Do any major gaps exist in our understanding of the ozone-depletion phenomena? Are increases in greenhouse gases delaying recovery of the ozone layer?